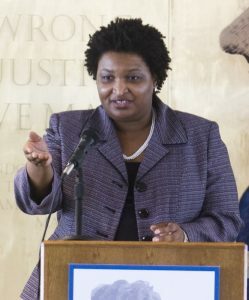 Stacey Abrams, Democratic gubernatorial candidate, filed a lawsuit on Sunday to block two Georgia counties from rejecting absentee ballots with minimal mistakes. Although she is behind, she refuses to concede the race until every vote is counted. The lawsuit argues for Gwinnett and DeKalb counties to contact voters and fix ballot mistakes instead of discarding the ballots. There are two major issues with the uncounted ballots. Some provisional ballots cast by voters who have moved but whose voter registration lists their old addresses have not been counted. Some absentee ballots have the date of ballot completion, not the date of birth written under the oath section. Republican Brian Kemp currently has the majority with 50.3% of the vote. He has resigned as secretary of state to begin the transition to governor. Kemp declared victory on Wednesday morning and began discussing his transition on Thursday. President Donald Trump took to Twitter to congratulate Kemp on his win. With provisional and absentee ballots still being counted, it is possible Kemp’s share could drop below 50%. If Kemp drops below 50%, even if he has more votes than Abrams, the race will automatically go into a run-off on December 4. Kemp’s campaign said that there are not enough outstanding votes to change the outcome. Despite Kemp claiming the win, the race is still too close to call for many outlets. The lawsuit also requests the certification deadline to be extended until Wednesday, not the original Tuesday. This is to ensure adequate time for the counties to count every vote.